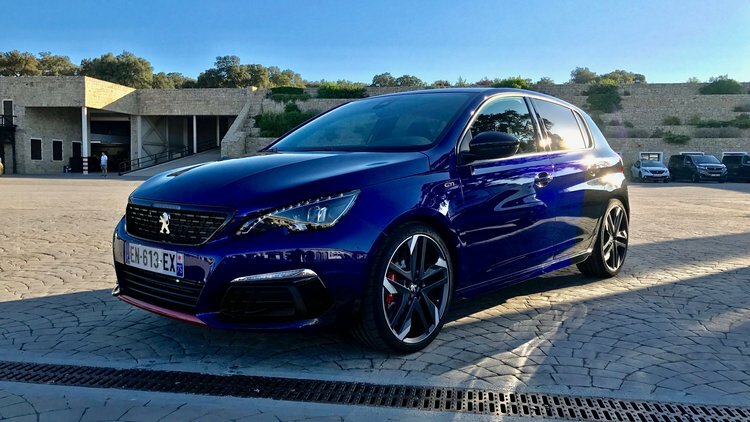 There’s a very good reason for Peugeot to bring us half way round the world to thrash their updated Peugeot 308 GTi around the tricky Ascari race circuit in Spain – simply, it’s still one of the world’s great driver’s cars. In fact, so keen is the French carmaker to prove to the world that its fastest hatch can still a cut it, Peugeot is not even bothering with a road loop this time. For this event, it’s a pure track session, and there’s not a single complaint from the gallery. 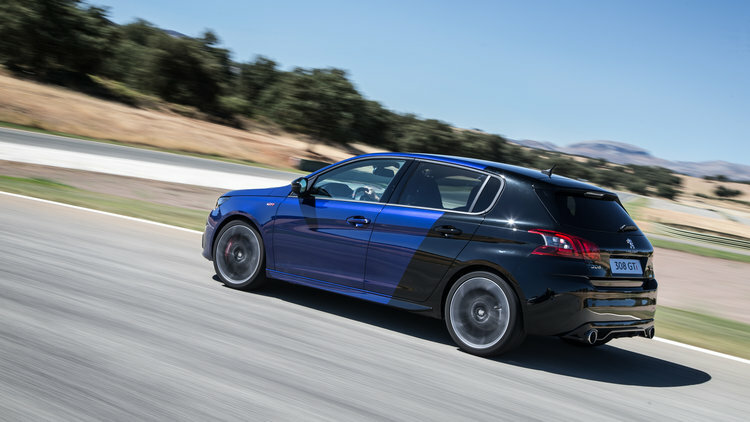 We're here because it’s the first update of Peugeot Sport’s (the specialised division charged with turning garden variety front-drivers into properly quick, corner-carving rock stars) second-generation 308 hot hatch, incorporating a few mild cosmetic tweaks, as well as a smattering of new tech and safety gear. Not only does this turbocharged hatch compete directly with Volkswagen’s benchmark Golf GTI, but it also lines up against Mini’s JCW hatch and even Ford’s much lauded Focus RS (at least on price). On power alone, though, it’s more a rival for the Focus ST.
Never before have fans of hot-shot hatches had so much choice, but the battleground is about to go global with the arrival of new players like Korean car giant Hyundai – poised to launch its own performance hatch in September, badged i30 N.
There’s also a new-generation Megane from Renault Sport on the way, and let’s not forget Honda’s new Civic Type-R – an all-time favourite and the most potent iteration of this Japanese icon ever. As updates go, this one barely registers. A facial, maybe, but that’s about it – a few bits and pieces here and there, but underneath, it’s exactly the same mechanicals on show. Up front, there’s a new black radiator grille, revised bonnet and new front bumper with slightly larger intakes and LED headlamps. It looks marginally more grown up, but typically understated, but for the side-skirts and fattish exhaust tips. The rear lamp protectors are now smoked, while the LEDs now glow with a three-claw light signature in keeping with the famous Peugeot lion so inherent with the French marque. More obvious, is the exclusive Coupe Franche paint job buyers can opt for; an impeccable high-end two-tone finish, combining Magnetic Blue and Perla Nera Black paints, without so much as a visible seam between them. You’ll also get Peugeot’s latest-generation infotainment technology, incorporating a new touchscreen with capacitive sensing and mirror screen functionality. Navigation has also been upgraded to Traffic 3D and there’s a full suite of up-to-date safety aids like active lane keeping assistance, auto headlamp control, active blind-spot monitoring, driver attention warning, speed recognition system, and park assist. All relevant stuff in this age of technology mollycoddling, I’m sure, but barely worth a nod to the genuine enthusiast, far more focused on the machinery under the bonnet and how adept the car is at tearing up a meandering B-road or rounding up a few supercars at the annual track day pilgrimage. On paper, the 308’s 1.6-litre four might seem grossly out-gunned amongst a raft of beefier 2.0-litre rivals. The one exception is the all-wheel drive Ford Focus RS – the official Floyd Mayweather of the bunch, packing a next-level 2.3-litre Ecoboost mill. But don’t think for one moment the Pug is the underdog in such company. What those gifted French sorcerers at Peugeot Sport are able to extract from this diminutive twin-scroll turbo motor is nothing short of extraordinary – 200kW of power and 330Nm of torque driving the front wheels via a six-speed manual gearbox, exclusively. They’re the same mechanicals we liked so much in Peugeot’s misunderstood RCZ-R coupe – that is, a semi-exotic powertrain developed with racing in mind, so it could take higher temperatures. A few specifics are worth recounting. The pistons are from Mahle Motorsport; forged, using a grade of aluminium used in Formula 1. Even the conrods were specified to withstand continued use at high speeds, while the bearings are covered with a polymer coating to withstand higher cylinder pressures. More impressive still, is the Peugeot’s impossibly lean 1205kg reading on the scales. That’s against Golf’s 1324kg and Mini’s 1220kg – a clear winner then, in the power-to-weight stakes, and understandably quick off the line, as hatches go. It’ll scoot from standstill to 100km/h in six seconds flat – four-tenths faster than the Golf GTI and one-tenth better than the John Cooper Works-prepared Mini. But like most hatches in this class, straight-line performance takes a back seat to more important considerations like chassis tuning, suspension geometry, brakes and even tyre selection. And that’s where the Peugeot really starts to look good. 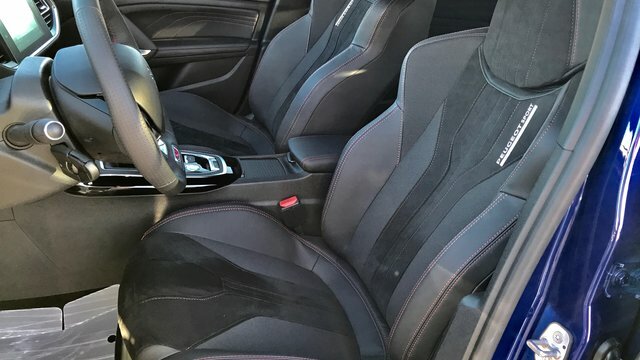 Still, the body-hugging sports seats - upholstered in a combination of leather (I think) with non-slip Alcantara inserts prove to be as comfortable as they are supportive on a race circuit. Practicality clearly remains a strongpoint for the hot-hatch fraternity, with the 308 GTi all but eclipsing its rivals in this area. Rear seat legroom is comparable to the VW, though boot space of 470/1740 litres is considerably more than Golf’s 380-/1270-litre space. However, we won’t be putting those family values to the test today, not at Ascari. That kind of assessment will need to wait until we get the car on home soil, later in the year. Time to fire up the GTi and see just how capable this heavily-armed French feline is on track. The exhaust note is a bit muted for my liking – until you push the oversize button marked ‘Sport’ – then it suddenly morphs into a high-tempo refrain with double the decibels. I use the first lap for sighting purposes, given it’s been eighteen months or so since my last visit, and that was driving a Porsche Carrera 4 GTS – a very different kind of car. There’s a bit of a flat spot down low, but once the engine is spinning at 2000rpm or above, the 308 starts to really pull hard. And it keeps on pulling with levels of torque you might expect from a larger displacement motor. In fact, on a track like this, you won’t run out of puff, and that’s in fourth. It never sounds stressed, either. Even when it’s peaking, the 1.6 isn’t screaming its heads off. Power is delivered in a very linear fashion, there’s no sudden boost to upset the car’s outstanding balance and poise. While the gearbox presents a nice fluid action, the throws are far too long to be of any real value on a circuit like this. It makes heel and toe shifting redundant, as World Rallycross driver Tim Hansen pointed out earlier on in the morning’s session. It doesn’t take long to build confidence in the Peugeot either, after just a few laps, it’s a car that inspires enormous confidence, mostly because of the ludicrous levels of grip available and the sheer stopping power of the Alcon brakes. There’s a fast-right-hand sweeper at the back of the circuit where I was lifting earlier – now I’m taking it flat, and the 308’s composure is rock solid – I mean, seriously, I can’t feel it move a millimetre off-line, even though I’ve got some reasonable steering lock on. And those race-spec stoppers are proving to be invaluable, as far as late braking goes. The official braking marker into the hairpin off the back straight has been set at 100 metres, but we’ve just halved that distance in the 308 GTi, and even then, we’ve built in some safety margin. And it’s not just the stopping power, alone; the progressive pedal pressure makes it all seem so easy, especially when a gentle tap is required to balance the car before turn-in at the end of the straight. There’s a lot of grip from the Michelins, too, as they bite into the tarmac at Ascari. But there’s also enough give in the tyres to mount a few of the kerbs here, without affecting the car’s composure through the chicane at the end of the main straight. It might be a front-driver, but forget about understeer, even under serious loads. There just isn’t any. In fact, you’ll find yourself getting back on the throttle earlier than you might normally do here, even with some moderate steering lock on, and it just turns and goes. Part of that also comes down to the sweet steering, meaty enough to rely on, and quick to respond, though not a massive amount of feedback. The only other front-wheel drive hatch we’ve driven recently, that feels as agile and responsive, is Hyundai’s yet-to-be-released i30 N Performance, otherwise it’s in a league of its own. You can feel the diff at work, as you get back on the power out of the tighter corners. There’s no squirming about, it just puts the power down and you’re blasting out of there towards the next turn. As if several 20-minute sessions at Ascari weren’t enough, we then strapped into Peugeot’s 308 Racing Cup car with French racer Charlotte Berton in the co-driver’s seat. 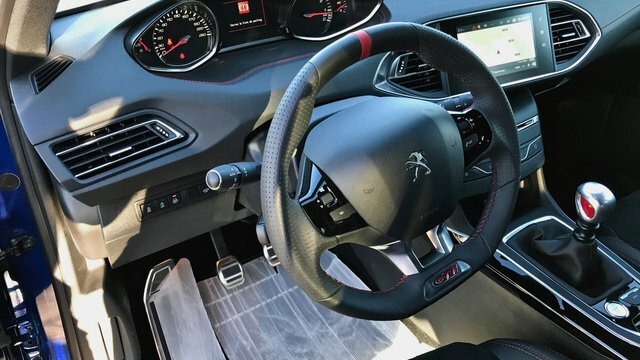 It’s a purebred racing car that uses the same 1.6-litre motor from the 308 GTi, only with a turbo from the 208 T16 Turbo, and six-speed sequential control gearbox with paddle-shifters. It weighs just 1100kg, and there’s no ABS or ESP. Naturally, it makes a great sound and goes a lot harder than the road car, but still just as easy to pilot. The updated Peugeot 308 GTi will arrive in Australia in October, although pricing and spec is still to be announced.